One of the defining characteristics of humanity is the creation of art. Whether it be tattoos, bodypainting or other personal adornment, jewelry making, the carving of fertility symbols and other religious iconography or scribing images of Stone Age beasts onto cave walls deep within the belly of the earth, our creative fires have been burning for a long time. Current research suggests the artistic urge goes as far back as 100,000 years or more. For most of this time the creation of art, whether visual or storytelling performance or dance, was an inextricable part of a people’s culture, recounting their origins and pondering the mysteries of the challenging and often threatening world surrounding them. The creation of art was not, to these people, a luxury. It was as necessary as the hunting and gathering required to feed the clan. Art was sustenance for the soul and the spirit, a way of knowing the world and one’s place within it beyond the basic sensory level. When I was a young teenager it was not unusual for a group of friends to gather in someone’s dark basement, den or bedroom and listen to albums. As dated as this sounds — and to some it may sound positively caveman-ish — it was, in fact, only a few short decades ago. Still, it cannot be denied that the practice had a definite connection to our deep art-making and art-witnessing past. In those dark rooms we listened…really listened…to the music in a way that informed our souls. Nowadays art, and especially music, is too often perceived as merely a commodity, something to provide a complementary backdrop to furniture or a buffering white noise in the home or office. The transcendence of art is too frequently unappreciated, not because it is missing but because we do not give art its due, its respect as something essential in our lives. My Christmas gift to myself this past holiday season was a mini-vacation to North Carolina’s Triangle area (Raleigh, Durham, Chapel Hill) to see the traveling exhibition of Spanish artist Joan Miró’s later works at Duke University’s Nasher Museum. Miró’s surrealist, expressionistic canvases and sculptures are not for everyone. They are decidedly modernist, sometimes quite abstract, and the kind of creations referred to by the uninitiated as belonging to the “My toddler could do that!” school of art. But standing before these intensely colorful, expansive canvases (often I was only inches from the painted surface) the viewer is forced to confront the purpose behind each brushstroke, each color choice, to account for deviations from the underlying sketch, to acknowledge a mind at work. In such close proximity the paintings suddenly are more stunning, more impressive, more loaded with meaning and, simultaneously, less intimidating. The sculptures somehow appear to have been created only yesterday while also possessing the cryptic gravitas of ancient religious icons — at once contemporary AND 8,000 years old. But these were not the works of an art god, each perfect from its very incarnation. This was not an exhibition of the unattainable. No. It was a collection of brilliant works concepted, sketched, redrawn, painted, sculpted, revised, revised again and again and finally named and presented to the world by a man, a very talented, dedicated and mystical man, but just a man, nonetheless. And for me, it was a reconnection with the act of creation as a sacred experience, the way it once was for all of us. Take a friend or your spouse or child and go see some art. Attend the theater. Spend an evening in the company of musicians. And maybe, just maybe, experience something transcendent in the process. As is the case anywhere there is a largely resort- and service-based economy, time is at a premium during the in-season. Routinely working long hours in double shifts and sometimes double jobs, many Outer Bankers barely have time to keep themselves well-fed and clothed during the height of the season. But winter can provide a respite for some of us, a time to recharge, reconnect, reassess and perhaps do something for ourselves after the basic daily responsibilities are met. If you can count yourself among this lucky group, then the Dare County Arts Council can perhaps assist in your personal growth with one of its upcoming workshops. First up is the Steam Punk Flowers Workshop conducted by artist Cyndi Buell and set for Saturday, January 31 from 10 a.m. to 5 p.m. (with a lunch break) at the Dare County Arts Council gallery in downtown Manteo. What is Steam Punk, you ask? Imagine an aesthetic mash-up between contemporary styles and technology and that of the Victorian/Industrial Age — all powered by steam animating a byzantine system of gears, levers and cables — and you’ll be getting warm. In DCAC’s Steam Punk Flowers class, participants will learn polymer clay basics and progress to making their own flower sculpture/pendant utilizing polymer clay, watch parts, found objects, colorful glass beads and wire. All tools and materials will be provided. Additional supplies can be purchased for a small fee. The $85/person class is open to all levels of experience; to register call (252) 473-5558. So, how many of you were gifted with a new digital camera for Christmas, one that you’re terrified to use because of the overwhelming array of buttons and features and the nearly inscrutable directions provided by the manufacturer? Or perhaps you’re one of those who has had a camera on the shelf for ages…just sitting there…mocking you with its presence each time you pass, eyes averted in shame? Well, perk up! Now’s the time to change all that with the Beginner Digital Photography Workshop being offered by DCAC Saturday, February 7 at 10 a.m. in the Arts Council gallery in downtown Manteo. Whether you’re intimidated by the setting up of your point-n-shoot camera or just stuck in the safe but limiting universe of your DSLR camera’s Auto Mode, instructor Shirley Whitenack will share her 40 years of award-winning photography experience to help you take control of your image taking. The class covers basic camera mechanics, the selection of a file type, shooting modes and flash as well as the fundamentals of exposure, shutter speeds, f-stops and ISO settings. White balance, metering modes and focus will also be discussed. The class is $65/person and includes informative handouts. Feel free to bring a snack and drink for a working lunch. For more information or to register, call (252) 473-5558 or visit the Arts Council website. Don’t Miss Theatre of Dare’s Latest Hit! Theatre of Dare’s well-received production of the Pulitzer Prize-winning comedy You Can’t Take It With You returns this weekend for the second part of its two-weekend run. The screwball comedy revolves around Penny Sycamore and her extended family, a firework-making, snake-loving, bad-dancing group whose youngest daughter, Alice, falls in love with Tony Kirby, the son of her boss. However, when the freewheeling Sycamores meet the wealthy and uptight Kirbys for dinner, nothing goes as planned and fireworks ensue. Tickets are $11/adults and $6/students and are available online and at the door. Friday and Saturday shows begin at 7:30 p.m., and the curtain goes up on the Sunday matinee at 2 p.m. All performances will be held in the auditorium of the College of the Albemarle’s Roanoke Island Campus in Manteo. The Graveyard of the Atlantic Museum continues its string of informative lectures Thursday, February 5 at 11 a.m. with Matters Of Steel: Examining the Deterioration of a WWII Merchant Shipwreck, the first of a series of lectures highlighting the latest North Carolina research on a diversity of maritime topics — from reconstructing pivotal battles, iconic shipwrecks and critical industries of yesteryear to the challenges involved in the study and preservation of North Carolina’s maritime past. The free lecture will be presented by Kara Fox of East Carolina’s program in Maritime Studies, East Carolina University. The program will also be available during a 6 p.m. live-streamed online presentation hosted by The Coastal Studies Institute. For more information call (252) 986-2995 or email maryellen.riddle@ncdcr.gov. The Graveyard of the Atlantic Museum is located in Hatteras Village just past the ferry docks. Ruth Wyand and Kevin Roughton bring complementary voices, great songs and even better musicianship to Trio Wine & Cheese in Kitty Hawk. On Friday night The Mo-Rons play at Aqua in Duck, The Other Brothers gig at Poor Richard’s in Manteo, The Deloreans perform at Kelly’s in Nags Head and the End of the World Blues Band jams at Ocean Boulevard in Kitty Hawk. If dancing is your forte, bring your best moves to the groove at DJ Sho’s Black Light Dance Party at The Brewing Station in Kill Devil Hills. On Satuday night you’ll find the band BC at Aqua, Chickweed at Poor Richard’s, Three Amigos at Trio Wine & Cheese and Here and Now performing at Kelly’s. 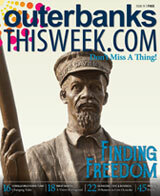 Visit OuterBanksThisWeek.com for performance times, directions and other details. This time you have a chance to win a $35 gift certificate to Kinnakeet Clay Works Studio & a $35 gift certificate to Gaffer's Sports Pub! For more information about Kinnakeet Clay check out their website. For more information about Gaffer's Sports Pub check out their website. You won a one-night stay to Oasis Suites Hotel & a $35 gift certificate to Gray's Outer Banks! For more information about Oasis Suites Hotel check out their website. 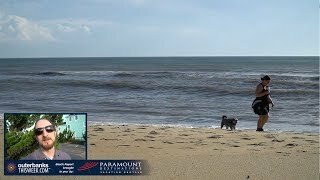 For more information about Gray's Outer Banks check out their website. Michael Lay is a local graphic designer, artist, photographer and writer. He lives in picturesque downtown Manteo, NC, and is the manservant of two beautiful and willful feline princesses, Sophie and Sassy. You can contact Michael at mike.lay@oneboat.com. Save $15 on any flight Saturday through Tuesday or the first boat Monday through Friday.